There are more indie stamping polishes hitting the market, lately. 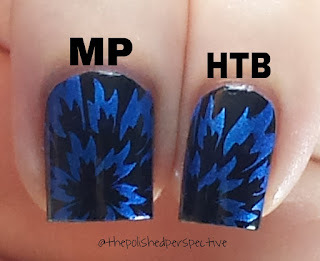 So, I decided to do a comparison post with two stamping polishes that recently became available to purchase. I am comparing M Polish (MP), Pish Plashin' Around and Hit the Bottle (HtB), Blue-tiful. Both are a vibrant blue stamping polish with a metallic finish. 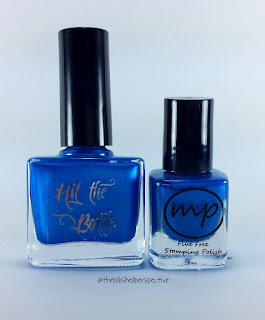 M Polish was provided for me to review and Hit the Bottle was given to me by a friend. I did not purchase either of these products. As you can see, there's not much difference in color and opaqueness. They are very similar. They were both easy to work with. I had no problems with pick up and transfer with either of them. However, MP is five free (shown in the bottle shot above and listed here) and HtB is three free. There is some confusion on whether HtB is actually three free versus five free. On the bottle, it is clearly marked three free. 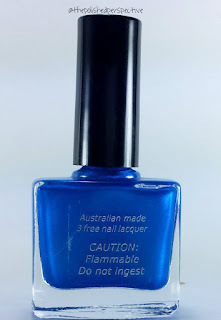 This polish is also described as three free on the HtB website (here and here). Here is the label on the back of the bottle that has the label. MP, Pish Plashin' Around is listed as $3.25 for the mini (5mL) and $9.50 for the full (15mL). HtB, Blue-tiful is listed as $3.00 for the mini (4mL) and $6.75 for the full (9mL) on the main website. However, they do not ship to the United States. If you live outside of Australia you can purchase HtB at Beautometry. 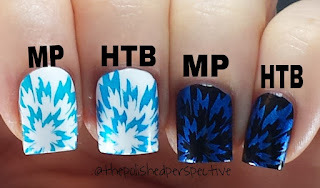 HtB, Blue-tiful is listed as $7.00 for full size on the Beautometry website. I'm not seeing a mini option available for purchase. M Polish offers free shipping of $50 in the US, free shipping over $60 to Canada, and free shipping over $75 internationally. To ship one full size bottle is $2.50 for first class and $5.40 flat rate. HtB through Beautometry (I live in the Unites States so this is my option) is $2.79 for first class and $5.95 for flat rate. The polishes are very similar in color in performance. I don't think you could go wrong with either. Cost wise, breaking it down a mini M Polish is $1.15 per mL and a full size is $0.80 per mL with shipping. If you hit the free shipping mark, it will be even lower. HtB through Beautometry will be $1.08 per mL for full size with shipping. So, you will be getting more for less with MP. I prefer having the option of buying a mini polish to try out. I also like that if I choose to buy a full size from M Polish, it will have more polish in it. The bottles. Oh, the bottles. I'm one of those people that packaging influences my purchasing of a product. 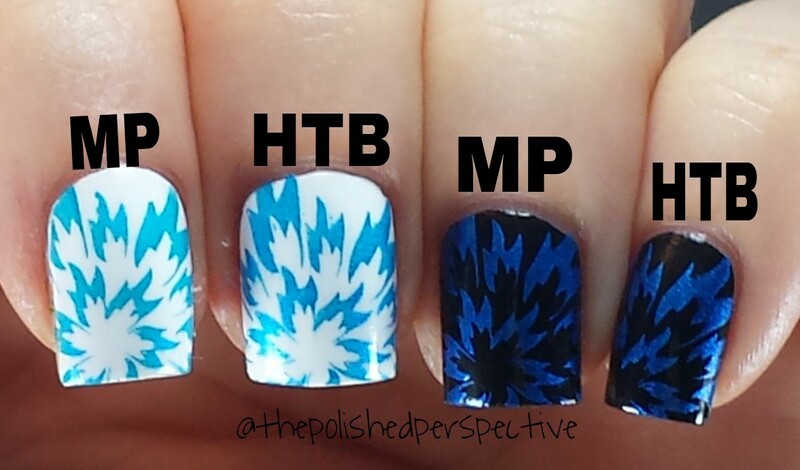 And, HtB polish bottles are ones that I would not buy. I do not like that bottle shape. I was also scared the bottle would tip over while I was stamping. I much prefer the bottle shape and size of MP. I choose M Polish for the pricing, size of bottles/bottle shape, free shipping, and the ability to order from her directly. Wonderful review I think I will be sticking with M Polish. So happy to hear because my M Polish order just arrived yesterday! I'm another person whose buying purchases are also influenced by bottle shapes. When you are stamping, you are going to be moving pretty quickly, and a bottle that is easily tipped over is not going to end well. Plus, the rectangular shape makes it difficult to get all the polish in the corners, wasting product and time trying to get it out. 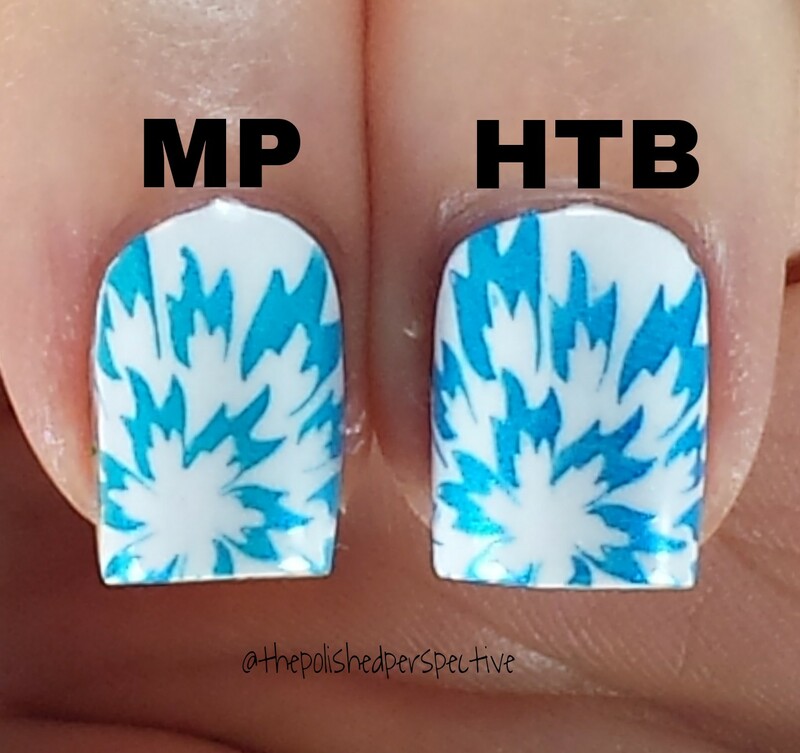 While the actual product performance is similar, the customer service of M Polish is hands above HTB. I've ordered both before, but M Polish had my label printed out that night, shipped by morning and in my pretty hands in days. Who else has that kind of turnaround? For the extra pennies for M Polish, I'd still order it over most other stamping polishes any day. Wonderful review! I will be sticking with MP always!! Great comparison, thank you for being for thorough and detailed! I have the M Polish already and was tempted to the try HtB but now I can oot for a different color! HTB is 5 free and she also offers mini bottles as well. You are misleading a lot of people with your inaccurate review. Thanks for responding! 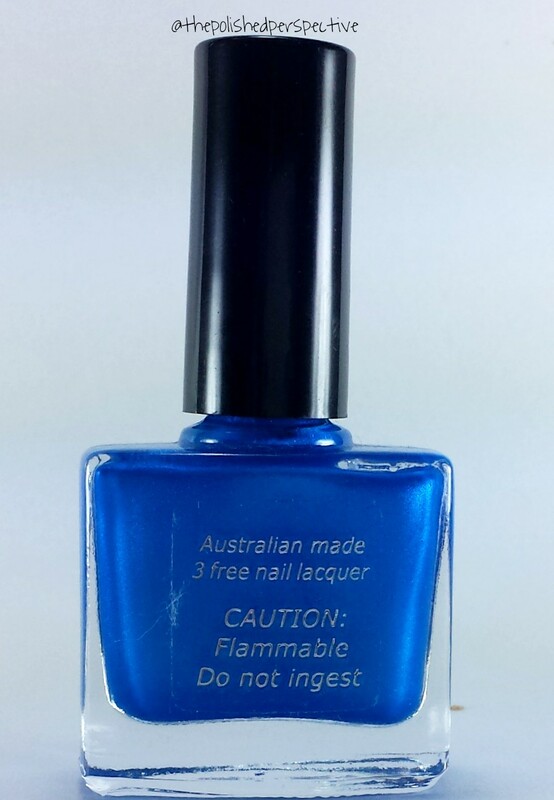 As shown above, the bottle is labeled three free and I have direct links to the main site and beautometry (where this polish was purchased). Yes. HtB does offer minis, as I stated in the above post. Beautometry does not at the time of this post where this polish was ordered. I live in the US and am unable to purchase through HtB. Thank you for reading. Can you show us where it says that HTB is 5 free? Because on the bottle and on all their website, it says 3 free. Maybe you wouldn't be mislead if you would finish reading the whole review. Maybe just MAYBE I KNOW WHAT IM TALKING ABOUT AND FYI, she does ship to the U.S. directly! Unlike you, I know the value of performing a full investigation before I write something. I can read just fine. Thank you very much! Thank you for this i was wondering about both and it would be easier to order from Beautometry however i was wondering if you have done comparisons in other colors? perhaps gold? and black thanks! Thanks Megan for your review of both of our products, yes they are much the same. Unfortunately I made a mistake when making up my labels and wrote 3 free instead of 5 free. They have always been 5 free and yes I know this is confusing! I can ship internationally according to dangerous goods standards, but its quite expensive to ship a few bottles .It's much cheaper to ship in bulk per bottle. Beautometry has not showed any interest in stocking the minis and once you take shipping into account, it is better value for money to offer the customer the 9ml size. My choice of bottle shape was limited to what was available to me, I assure you I haven't managed to tip one over yet! Thank you for clarifying whether it was 3 or 5 free with actual facts (unlike some other replies...). It might create less confusion and better reviews for your polishes if you would state somewhere on your website that the labels are incorrect and update your listings to reflect the change. As I do like your polishes, I would hope you would consider changing the bottle shape in the future, as I have unfortunately knocked over mine quite frequently. Just a thought. Thank you for the clarification of your labels. However, I need to point out that the author of this blog is not the owner of M Polish. The Polished Perspective is a nail polish.blogger. Megan/Megatuce is the owner and creator of M Polish. 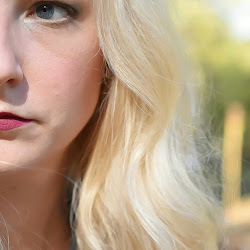 This blog belongs to me, and my name is not Megan. But, thank you for clarifying the above information! thank you for the review. It was nicely done, informative, and objective!